Request for help concerning Miehle *V* 50 X ?? Request entered on behalf of a 3rd. party Buddy with the problems. Basically the machine is an American original, apparently, Badged M.G.D. presumably Miehle Goss Dexter, ?? We believe that the (X) implies that it was/is fitted with the Double Roll attachment, clarification would be a help for starters, but the main/bigger problem is stated as, the Cylinder will not drop into the impression cycle. My pathetic efforts have verified that there is adequate vacuum, including acting on the diaphragm within the cylinder, the double roll device appears to be operational, sight unseen, end of story.!!! Any and every scrap of help will be appreciated and acknowledged. Apparently the M/c. originated from New York, some considerable time ago, was in storage for several years (U.K. or U.S. unknown) no rust apparently, vacuum good but piping not verified as yet,! … Converted to standard U.K. 3 Phase, on entry! all other motions (apparently) O.K. All and every piece of advice/help appreciated, even the minute one liner,s often help trigger the more obscure points. can only speak for v50. Start with the feed board. The board ends have the vacuum supply with rubber or leather washers on the underside, these need to be leak proof. Make sure all the holes on the feed board are covered up. If printing a small sheet any holes not covered need tapping up. If all the latter are good then it could be the diaphram which might need adjusting. This is difficult to explain but could scan the v50 instuctions and send by email if you think it might be useful. Frank, Thanks, good start, I can access and inspect another Non running, V 50 X, in daylight tomorrow, but the info will have to go down the grapevine, the needy will look in perhaps. Scan the Manual may become a good option, might be able to work of a little *Monotype* part ex. info.?? if I remember correctly, perhaps the *Old Goat* got that wrong, as well.?? I’m not a Miehle expert (yet), but the V-50x was the last model they made - presumably for check imprinting companies, so maybe there’s a roll feeder involved. Different sheet metal than earlier models, too. 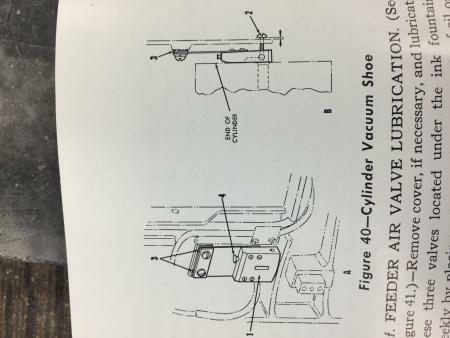 As I understand it, the cylinder won’t trip unless there’s paper on the platen, covering a vacuum sensor of some sort. V-50 operation manuals are available on Letterpress Commons, which might be a good place to start. Bill is correct that the X model was made primarily for the check printers, like Deluxe and Harlan. These incorporated features for the check printers like a pre-set stop after a certain number of impressions, and some other stuff I’m not too familiar with. But the double roll attachment was an after market device marketed by Hawes, not from Miehle. Hawes had a number of Miehle extras including a different feed table. The Model X still printed from cut sheets, no roll device. Operators were expected to run the press at full operating speed, and typically worked 2 chases, one on press and the second on the stone, making changes for the next imprint. Carl Schlessinger once offered a 2 part video of all the things Deluxe expected its operators to do on the X model, including settings and adjustments. The air balance to get the cylinder to go on impression is a bit tricky to learn—requires clean airlines in feed table, cylinder and from the air pumps and proper rubber washers in the feed table as well as competent air lines. The vanes in the rotary air pumps must be kept clean from oil and paper dust. A great press once it is understood. Bill W. & Fritz, as with Frank, (above) good stuff, Thank You both, now all one has to do is to begin to transcribe the points, into some semblance of order and progression, to pass on to the original (out of His depth) enquirer.?? Bill, Yes *Da Man* has just identified and eliminated the Vacuum Sensor, so the problem is elsewhere. Fritz, again Thanks, Thus far, it was always going to get complicated, being caught in the Middle of a multi sided Court of enquiry, see My original cry for help.!!! Fritz, we are fairly well up to speed with airlines and pumps as you imply and have been eliminated, up to a point, ….. for some reason over a considerable time, V.M.s seen here U.K. were/are equipped with 2 variations of *Pumps* Diaphragm & Vane type,s although this is not seen to be the cause of the problem either way…Have not established Yet which type is fitted to the M/c. in question. Appreciate and understand (possibly more than some) the Operating at full speed clause(s) ONLY because the author has worked in one or two Houses/Print Shops, that used Verticals, and although, generally, were never pushed to the point of fitting the *Largest* flat belt driving pulley, have been involved several times, resetting whole formes of Type on the Monotype of course, because the entire form had *Sprung* because it was not locked up properly etc. Thanks again All, thus far.Mick. I have a V50 that was made between the std 50 and the 50X. When I got mine it worked fine for a week or so then I lost impression. After tearing a lot down replacing gaskets ect, still no impression. Then I found it! Their is a bronze vacuum block on the right side that makes contact with the cylinder if the gap is too big it will not drop into impression. That fixed my problem! Have him check that out. J feltz, appreciated, all helping to compose the Big Picture, as I implied even the little One liner,s help, if only to eliminate.!! the *X*, *Y*, *Z* variables. Thanks. The authors Conscription/National Service, (Draft to Your Guys Stateside we Believe) was spent in the R. A. F. in regular and fairly close contact, with many of Your Guys from U.S. Air bases in the South of England, and Contrary to the alleged Myth, way back and still now, that implies that Our sense of humour is partially lost on American,s generally, the author begs to differ, the Best Laughs in the whole 2 years (conscription) were usually in the U.S. Air Force base,s … P.X. (B.X.) = the equivalent of our N.A.A.F.I. Social Club. The *ribbing* was 100% equal in both directions, so 60 years ago, the *Yanks* definitely understood *Limey* humour.?? O.K. virtually to a Man, they all had 22 Foot Cadillacs and usually, uncles with Oil Wells in Texas,!! but that made the best laughs, of all. Perhaps as *Geronimo* allegedly owned a Cadillac, maybe a few did own such, certainly a few were around, on some of the U.S./U.K. combined Air Bases. Mid 60,s onwards. Here is a pic of it. 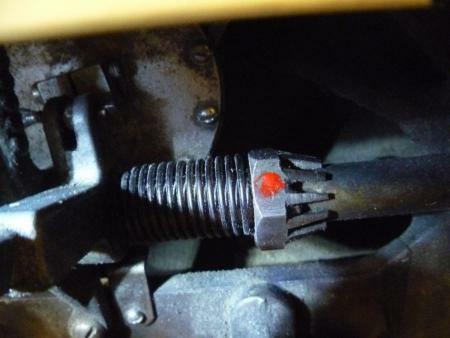 It makes contact with the end of the cyl when in the down postion. Adjusted with the bolt on the outside of the cover. jfeltz - from what publication did you get that image? It’s not in the V-50 manual I have, and the level of detail looks like something I may need before long (since a friend and I recently purchased 3 V-50s…). J feltz, thanks, will be sent down the grapevine in due course,!! but appears to have opened a *Can of Worms* in the best possible way. Certainly caused some *Pandemonium* ??? in the best possible way for Bill *W* above. Ta, Mick, and counting..? The other possibility is the Diaphram latch - which may need adjustment. have attached trouble shooting para from manual plus fig 38 illustration - item 5, plus photo of latch from my v50. I have a blob of red paint on it so that you know which way you have turned it. Frank, on behalf of *Da Man*? thanks again. He is mounting a *Wayzgoose* in a few days time, at the current rate of input, the author will have to take a *File/Folder* equivalent to or “bigger” than that, presented by Johnny Cash, when He registered his *One Piece at a Time* Automobile.???. Few things in line with a vacuum leak. The removable gripper bar has vacuum holes in the center of the bar. If these are not covered it acts as part of the miss detector and will throw the press off. I frequently clean them with a straightened paper clip. Also, leather washers under the gripper bar are seals for the vacuum system. Mike, as always Thank You, trying hard to assimilate the plethora of info coming in, because (as indicated originally) am caught in the (Middle)?? but it appears that some good has been achieved already, with other V.M. owners. Perhaps I should sideline all the *Monotype* c***/issues, >pro tem< and learn, or be shown how to Print Out?? relevant entries, culled from Briar Press.!! How’s progress ? we would all be interested to know how your mate is getting on..
Frank, and the many more who have contributed to this request/problem. Each and every Item is being Filed, Recorded, etc., etc., and the plan appears to be (current status) the Original enquirer is mounting A *Wayzgoose* very shortly, and in theory at least The M/c. V 50 x, …. the Original Enquirer, …. The Old F**t, (as in flatulence) will all be on sight, as one, for cross party discussions, over the Smoked Salmon Sarnies, and the *Douwe Egberts* (percolated) Coffee. IF NOT forthcoming in that respect, it could well be the only recorded *Wayzgoose* that degenerates into a Fracas, involving 72 Point, full face characters, at head height and at 10 paces.!!! What ever the outcome of the above, and the solution or answer, to the original Query, to the best of My ability, results will be published…Thanks again All…. Mick. D.O.F. ??? Bill, It’s in the “New and Improved V50” book. My V50 is what I call a middle run. Looks the same as an early 50 but has some of the 50X stuff. It has the adjustable blower on the feed table, has a cylinder tie bar to name a couple. Mono Mick has kindly fielded questions on my behalf re my non functioning V50X. Thank you for all your replies, the problem however persists! I have a question to all Miehle Vert experts. I have tied back the diapragm latch so it is not stopping the rotation of the bar it resists, but still no cylinder rotation. I am assuming that all previous replies have been in regard of a non operating latch due to air leakages so correct me if I am wrong but tying back the latch negates the air isuue, so what now? Zellerfish, Did you try the vacuum shoe as in my posts above? My investigations proved that the problem was not due to the failure of the latch disengaging, so it was out with the spanners! The ‘latch shaft’ is connected in the middle by a locking collar which is pinned and clamped. I disengaged the two halves of the shaft and found immediately that the left hand side could not rotate freely. The only thing that could prevent its rotation was the ‘air damping’ piston being siezed in its cylinder. I removed the piston (luckily not rusted in) and cleaned it and the cylinder of sticky ‘gunk’ and reassembled. 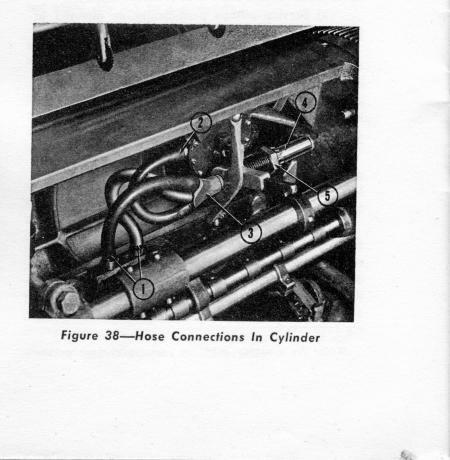 Note that the press had been unused for many years and had been sprayed to prevent rusting…some of that spray must have seeped into the gap between piston and cylinder and congealed. Cheers for all the comments which helped me fully undertsand the mechanism. Well done Ed, great detective work.